Registration is now open for the 2008 Europe, Middle East, and Africa User Conference (EMEA UC), which will take place October 2830 at the Queen Elizabeth II Conference Centre in the heart of London, United Kingdom. Themed GIS for Everyday Life, the conference will show how GIS applications span sectors, cities, and neighborhoods and are used nonstop for solutions and benefits recognized daily. Esri GIS users worldwide are invited to attend the EMEA UC, which is designed to educate and energize attendees about the future of GIS, current best practices, and the latest solutions that can be applied to their organizations and societies. Nations and regions will unite during this intriguing and active forum, bringing professionals across industries and thought leaders together to establish a valuable network of contacts, build relationships, and get updated on state-of-the-art geospatial technology. "Supported by feedback from Esri customers and distributors, we are combining the Esri European and Middle East and Africa user conferences," says Myles Flynn, Middle East regional manager, Esri. "This watershed of Esri-supported conferences will promote the exchange of ideas, strategies, and visions between global leaders in the GIS industry. GIS is a platform for better decision making that transcends cultural, national, and regional boundaries. This event will bring together like-minded people from a variety of backgrounds to openly discuss ways to leverage GIS and address the issues that affect us all." Professionals from organizations including government, defense, the private sector, utilities, conservation, and health care are encouraged to attend the EMEA UC. Attendees will be able to connect with one another and learn firsthand from their peers and Esri staff about ideas and tools for applying GIS solutions in their fields. Preconference seminars, user presentations, technical workshops, the Map Gallery, exhibits, a Plenary Session with distinguished keynote speakers, and more make this gathering a comprehensive event dedicated to helping users expand their knowledge and discover new possibilities. In addition, the gala dinner will be held at the Science Museum in a series of connected galleries, where guests will be able to dine and peruse the exhibits of the Exploring Space and Making the Modern World galleries. 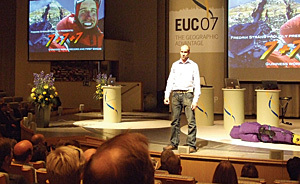 "We are delighted to be hosting the 2008 Esri Europe, Middle East, and Africa User Conference in the United Kingdom," says Nick Chapallaz, director of business strategy and marketing, Esri (UK) Ltd., Esri's distributor in the United Kingdom. "This promises to be one of the most exciting GIS events of the year. The keynote speakers have been selected to show GIS innovation at its best and demonstrate how GIS impacts everyday life. The conference will help the Esri community maintain an active and educated role in shaping the direction of the industry." From October 26 to 28, the 2008 Europe, Middle East, and Africa Education User Conference will also take place at the Queen Elizabeth II Conference Centre. The conference will be dedicated to professionals from all areas of education. There will be a GIS education keynote presentation, paper sessions, peer discussions, technical sessions, and hands-on workshops. Participants will find out about the newest education solutions, hear compelling user stories, and see exhibits and maps meaningful to the education community. The conference will be an ideal place to connect with other educators, as well as Esri staff and GIS users in many different professions. Attendees will be part of strengthening the GIS education community and be able to expand their GIS knowledge and skills for enhanced learning and problem solving in a range of education environments. "This international event is an outstanding opportunity for substantial knowledge growth and the chance to help make a difference, regardless of an attendee's line of work or prior GIS experience," says Jack Dangermond, Esri president. "A user conference is more than exciting updates and informative sessions; it's a powerful vehicle for sharing and collaboration." Users interested in being part of the EMEA UC can submit an abstract for possible presentation during the conference. The abstract submission deadline is July 18, 2008. Maps may also be submitted for display in the Map Gallery; the deadline to submit a map is October 2, 2008. Lastly, the deadline to receive the discounted early registration rate is August 28, 2008. Learn more about getting involved at the EMEA UC and online registration at www.gisforeverydaylife.com. 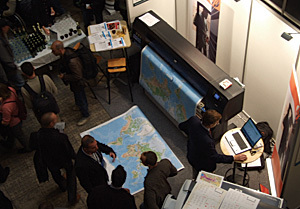 For a complete list of upcoming Esri events worldwide, visit www.esri.com/events.